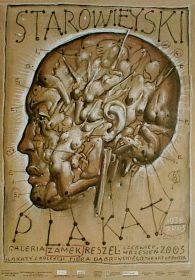 Franciszek Starowieyski, born 1930 near Cracow (PL), is one of the great polish poster designers, and also a painter, baroque calligrapher, television and theater scenographer, and as he likes to point out, a draftsman living in the 17th century. 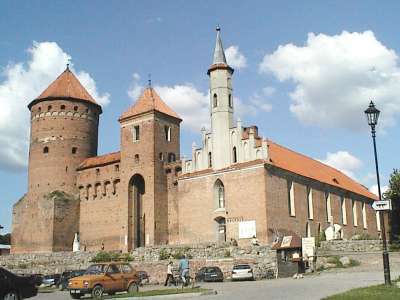 This web exhibition accompanies a current exhibition Franciszek Starowieyski Plakaty - Retrospektywa, from the collection of Piotr Dabrowski & Agnieszka Kulon at the Castle of Reszel (200 km N of Warsaw), Poland, June 28th to September 31st, 2003. The following text, reprinted from the catalogue, and the photos were kindly provided by Piotr Dabrowski, organizer of the exhibition, and Zdzislaw Schubert, author of the catalogue of works and bibliography. 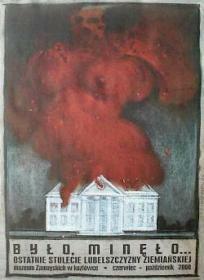 The poster reproductions are from the The Art of Poster Gallery web site, with permission from Piotr Dabrowski. 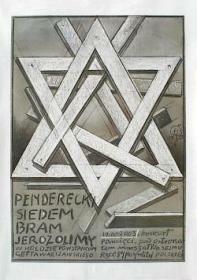 A poster, Polish poster, "Polish School of Poster Design", affiche polonaise, polnisches Plakat, and as if echoing those terms: Starowieyski, Franek, "Byk", Starowiej, Franio - for many years those words have been overlapping, intertwining, replacing - occasionally becoming almost synonymous despite lexical differences. 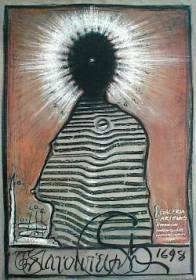 To be more specific "Franek" does not necessary stand for diminutive form of Franciszek - it may also signify a poster created by an excellent artist - bearer of that name. Well, perhaps this artificial semantic code can be deciphered only by small circles of poster lovers? - What is quite certain - prints marked with Starowieyski's name, for nearly 50 years, were opening an entrance into the world of Polish poster art, for all those who have been careful enough to notice "billboards", city walls, and advertising spots of movie- houses and theatre buildings. Anyway, such experiences became mine when I was just a teenage boy. 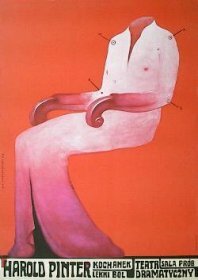 I can still remember those strange emotions, which I sensed spotting Dyskretny urok burzuazji (Discrete Charm of the Bourgeoisie) poster, while walking (in 1975) the city streets. 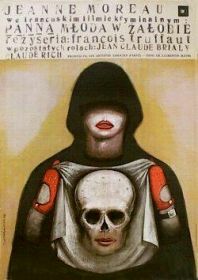 Today I cannot tell, which one of them I saw first - the fabulous poster or the famous film directed by Bunuel. I do recall, though, that my imagination was conquered by the first and not the latter. I got hold of this print instantaneously, feeling that I HAD to have it! I interpreted it intuitively, seeking perhaps too many meanings, but at the same time - freed from thoughts inspired by the film - I was able to feel pure pleasure just from looking at it, as if it was a painting, graphic work, or drawing. 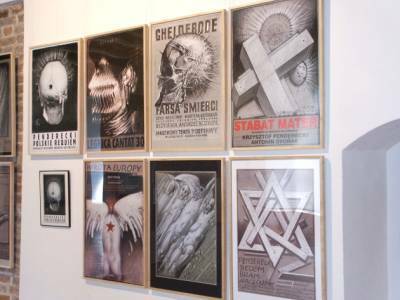 Near the house, where I was living at that time, there was the biggest "poster gallery" in Warsaw, i.e. a very long wooden wall surrounding so called Blue Skyscraper (a construction site left unfinished for nearly 25 years). It was probably there I saw, for the first time, other and equally splendid works by this great Master, such as Opis walki (Description of a Struggle) for the theatre performance based on Franz Kafka's prose, or full of dramatism Jak wam sie podoba (As You Like It) to Shakespeare's play, or yet controversial and scandalous Biale malzenstwo (White Wedding) - designed for the theatre performance by T. Rozewicz. At those days I didn't collect posters, but I already had some of the pieces mounted on the walls of my room - they simply soothe my eyes. 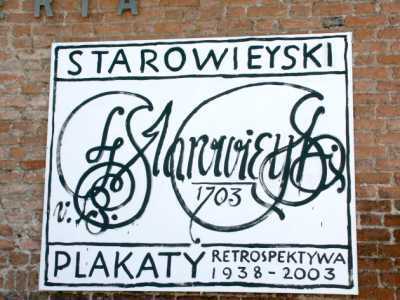 Surely, I was also fond of works by other artists, which were displayed everyday anew on the city walls, but Starowieyski was for me the No 1, anyway. 1981 became crucial moment of my life. In this year I started working in the Graphic and Poster Gallery in Warsaw. I found this an ideal place for me, where every day gave me an opportunity to see and marvel at hundreds of works by various artists. 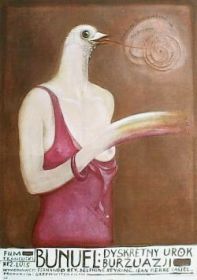 In those years I got acquainted with early works by Franek, dating from the 50s, as well as with his masterpieces from the 60s. Some of those I already knew from albums, but only when I saw them in proper sizes I could really appreciate. From then on I got fixed with the idea of having them all for me. 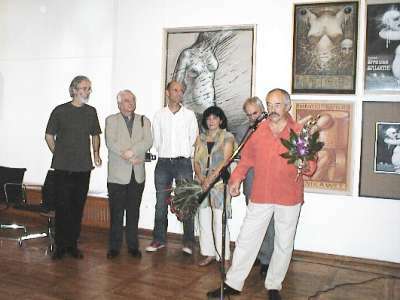 This gallery job helped me somehow to develop a collector's passion, the real incentive, though, being the artist's gifts (he co-operated with the gallery and quite often visited the spot). 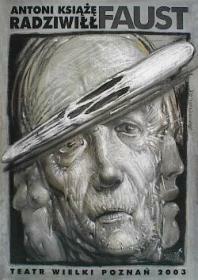 Successively, I collected nearly all of his stuff, although, some of his early works I still ceaselessly try to find. Every new gain, which I add to my collection, gives me enormous joy. 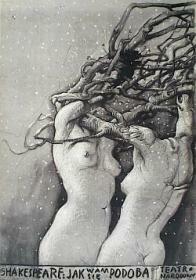 Starowieyski's creative output is full of unpredictable twists and mysteries. - Equally mysterious is actual list of his edited posters. - To be more precise, it is not quite clear if the original, German issue of the Die Zoffen poster does really exist, or if it ever existed as a print? 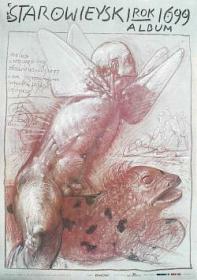 - One has to remember, that not all created designs, which were sent to editors, found their way to final prints. Incidentally, during preliminary works on this present catalogue, several posters - unknown until now - has been discovered. Collecting posters by Franek somehow gave me a push to gather other works by different artists. 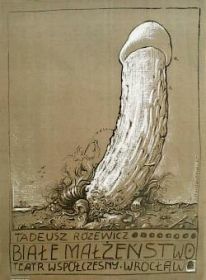 At present, my collection contains about dozen of thousand posters from the years 1899-2003, and yet the Franek's prints are the very core of it. I always eagerly come back to them. Despite of the time passing, they are able to evoke enchantment while seen, and they still inspire my imagination. My professional activity in the last few years I have carried on my own (through The Art of Poster Gallery). 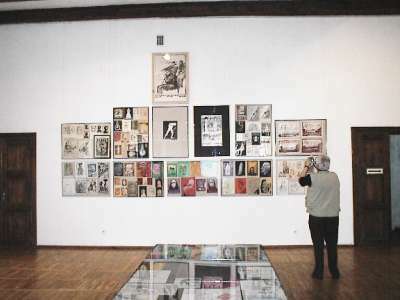 It goes far beyond the task of collecting, as it also covers the fields of exhibiting, publishing and selling posters. 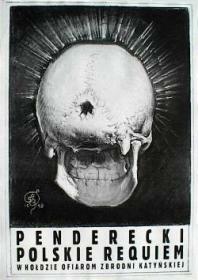 The international market of art has already discovered this fascinating Polish poster phenomenon, many years ago. 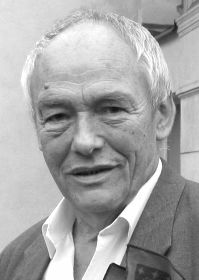 Works by Starowieyski are among those of highest esteem and most frequently merchandised. They are being acquired for the collections of the most important museums, as well as being put on sales by the best galleries - but first of all, they are still highly prized by individual collectors. Normally posters are printed in quite large numbers of copies (varying from some hundreds to several thousand), which make them relatively easy accessible to this art lovers. Alas, that applies to the most recent editions. The earlier ones, preserved sometimes in scant number of copies, can reach very high prices. 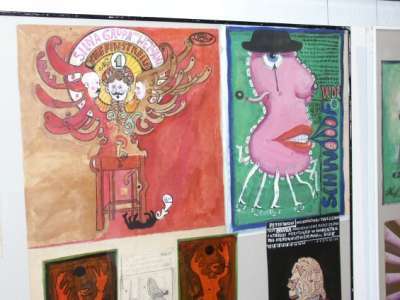 Such posters by Starowieyski as Zbuntowana orkiestra (Fanfare), Kochanek Lekki bol (The Lover), A Slight Ache, Frank V, Louis Armstrong (Satchmo the Great), Teresa Desqueroux or Panna mloda w zalobie (The Bride Wore Black) have been for years the objects of desire among poster lovers in the entire world and, due to the fact, reached prices up to several hundred times higher than the prices of recent editions. Well, the real daily life is run mercilessly by money, quite unlike contact with Starowieyski's works, which enables us to reach totally different dimensions. The artist's great power of imagination, his ability to create unrepeatable charms, perfection of his drawings, sensitivity to colours and unique style, which doesn't follow crowded paths of artistic fashion and trends - those qualities allow him to create masterpieces, which in turn allow me to forget for a moment the miseries of daily life. 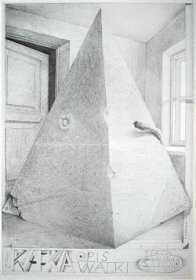 Catalogue of an exhibition at the Castle of Reszel (PL); with texts by Franciszek Starowieyski and Piotr Dabrowski, and a catalogue section by Zdzislaw Schubert with very detailed descriptions of each Starowieyski poster, including thumbnail, exhibition history, prizes, different versions, number of copies printed, and so on. The exhibition and the catalogue are of such an outstandig high quality, and there was such a good cooperation between artist, poster dealer and museum, that I can only add Chapeau ! to all connected with it.